I have been doing a lot of knitting (as per the usual), but not a whole lot of actual progress. Could be because I want to knit 56,643,216,577 things right now and have managed to start three new things recently. One of these things were to try out some yarn I bought on Etsy. The yarn is from Tricot Treat. I came across this yarn when I was looking for some super hot pink yarn for some socks for a friend. This seemed to fit the bill and I messaged her about it because I knew I would need more (they are to be knee socks). She let me know that she did have more than what was listed in the description and let me know that it’s not super hot pink (as in it could be brighter) and offered to custom dye some for me. I decided that I did want some thing as bright pink as possible, so I opted to go with the custom dye. I did, however, decide to buy the 4 skeins that she did have. I LOVE pink and so does my sister, so not only could I get some socks for myself, but her as well. How can I say no to pink sock yarn? I just can’t, so it arrived and I’m in LOVE. 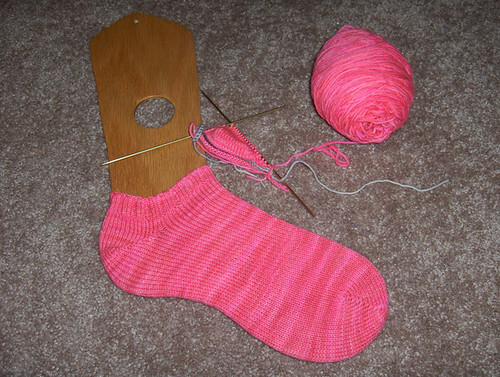 I really like working with this yarn and I love the resulting sock. I will be buying more as soon as I can. 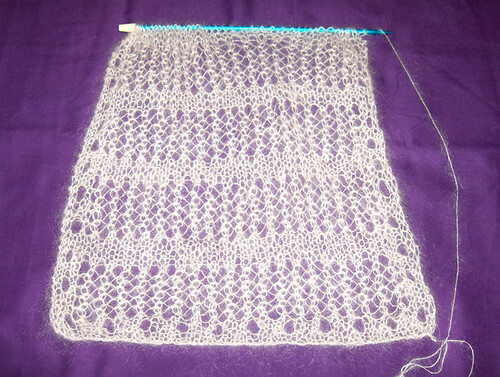 So far I am 4 repeats in and it’s moving along fairly quickly when I’m actually working on it. It’s Kidsilk Haze. It took a bit of getting used to, but I’m doing good now. FYI: metal needles for this yarn – bamboo just won’t do it because this stuff sticks like gule to them! Most of my time has been taken up by another scarf which I can’t post pictures of right now, so this is a little stalled at the moment (as are the socks). Here’s the biggest news this week, though! 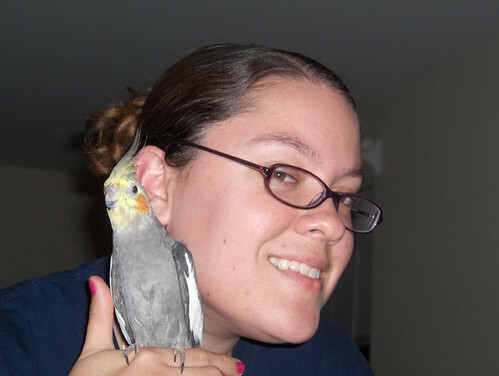 I got a bird! A cockatiel, who I named Fry.